Another tune that we’re trying to fit in as we continue to play catch up on a daily basis! Hopefully we’re not featuring this one too late, but if we are, it’s still worth it… if like us you’re a sucker for a bit of tribal chanting and sax! 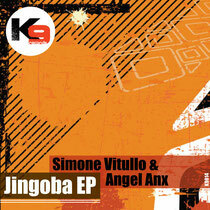 This new one from Simone Vitullo & Angel Anx is already out on K9 Records and has been garnishing support from artists such as Marco Carola, Roog, Luciano, Richie Hawtin, Andy Cato, Davide Squillace and Mark Knight. There are three mixes to choose from. The third mix is from F.Sonik, who gives the track a slightly tougher feel whilst still keeping much of the original’s main parts. Our preferred mixes though are the Jingoba Sax and the Jingoba Original. The Sax mix just moves along nicely with a nice, light, tribal feel, but its real beauty is when it hits the breakdown and introduces a subtle sax sound, nothing too overpowering, but enough to give the track a real good groove. The Original mix probably shades it for us though. Again, it moves along with a light, tribal feel, but this time at the breakdown some beautiful ethnic tribal chants appear, giving the track a completely different feel from its Sax counterpart. Really liking this one, have a listen below.